Three Causes of Prescription Drug Injuries in Iowa | Hupy and Abraham, S.C.
Why Do Some Medications and Medical Devices Cause Unexpected Injuries? Many pharmaceutical products have side effects, and some of those complications are significant. 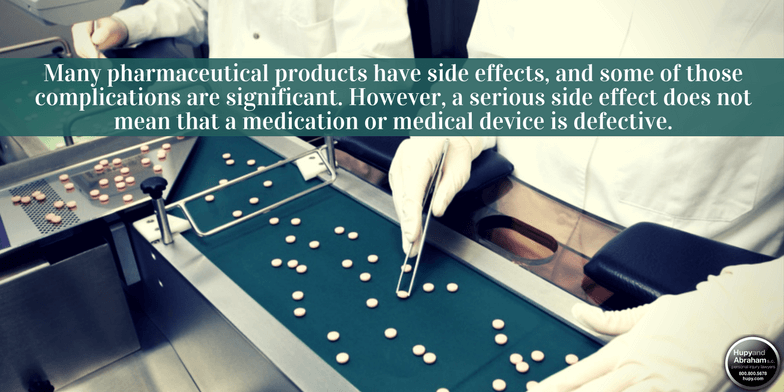 However, a serious side effect does not mean that a medication or medical device is defective. Was the Medication or Medical Device That Hurt You Defective? The product was negligently designed. The design of a new medication is an important process. Pharmaceutical companies not only have to design a drug that will treat a specific condition, but they also need to take reasonable steps to identify any potential side effects to be sure that the benefits of the medication outweigh the risks. If this does not happen, then the pharmaceutical company may have been negligent in the design of the medication. The product was negligently manufactured. Medications need to be made according to the design that has been approved by the Food and Drug Administration (FDA). If the medication is not made according to the design or some contamination occurs during the manufacturing process, then the medication could have unanticipated side effects. The product was improperly marketed. Pharmaceutical companies have a duty to warn doctors and patients about the potential dangers of a medication. If advertisements are misleading then patients may be hurt. Remember, just one of these things needs to be true in order for you to potentially pursue a pharmaceutical class action case. If you have been injured by a medication then you might not know whether it was the design, manufacturing, or marketing that caused your injury. However, in order to recover damages you are going to have to find out. An experienced pharmaceutical class action lawyer can conduct a thorough investigation and find out exactly why you were hurt so that you can seek damages for your recovery. To learn more about how a pharmaceutical class action lawyer can help you if you’ve been injured by a medication in Iowa, please start a live chat with us or call us any time to schedule your free, no-obligation consultation.